Ven. George Churinoff teahcing. Photo courtesy of Ven. George Churinoff. Mandala spoke with Ven. George Churinoff in early February 2013 between his classes as a visiting instructor at Maitripa College in Portland, Oregon, U.S.
Mandala: What is the benefit of in-depth Buddhist study? Ven. 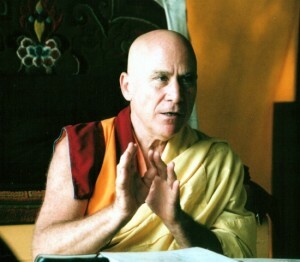 George Churinoff: All of our lamas, almost without exception, have great educations. So if you look from the outside, there must be something there, some importance. There are three kinds of wisdom that you have to build up sequentially. The first is the wisdom of hearing – hearing the teachings, reading and studying. Next is the wisdom that arises after having heard and understood the words and contemplating their meaning, fine tuning your understanding through debate, questions and answers, and thinking deeply about these things again and again. Finally, there’s the wisdom that comes when you’ve got a clear understanding and you meditate on that and you place the mind on that single-pointedly. When we talk about the three kinds of wisdom, we would like to have the wisdom that arises from meditation. There’s this famous adage that you’ve probably heard that to try to meditate without having heard or studied is like someone trying to climb up a craggy cliff with no arms.